I needed something to serve with the soup and then I remembered an episode of Barefoot Contessa on The Food Network in which she had tried many different ways to make grilled cheese sandwiches but had finally come up with what she called “The Ultimate Grilled Cheese.” I thought that would be a perfect complement to the tomato soup so I brought out the panini maker (why I own this I really don’t know – I think I have used it all of once before) and made those sandwiches. The soup was really easy to make. 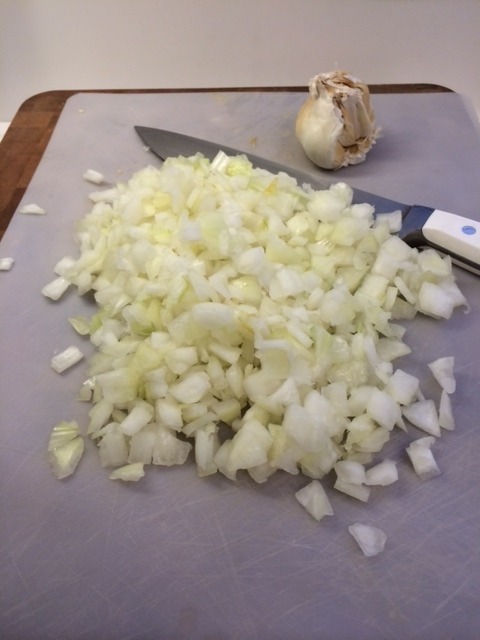 First I chopped up about 6 cups of onions and 4 or 5 garlic gloves. 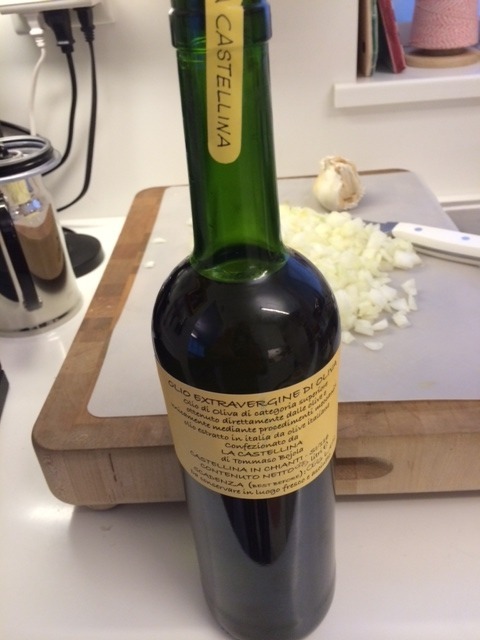 and let it go to work on the soup, which really thickened it up and blended in all of the ingredients. 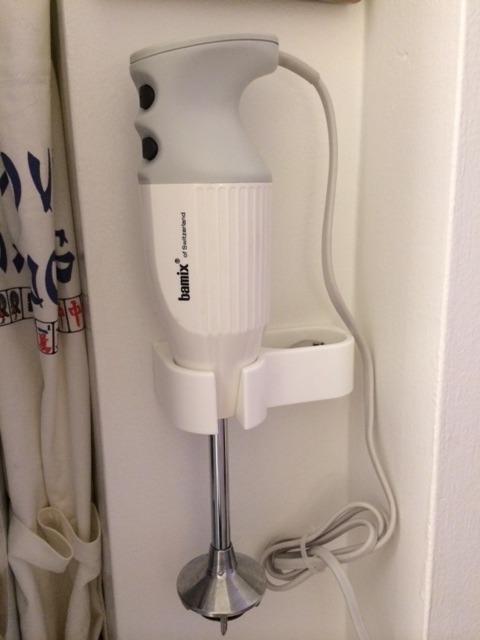 (You might be able to see my Mah Jongg apron hanging up next to the immersion blender – a gift from K). 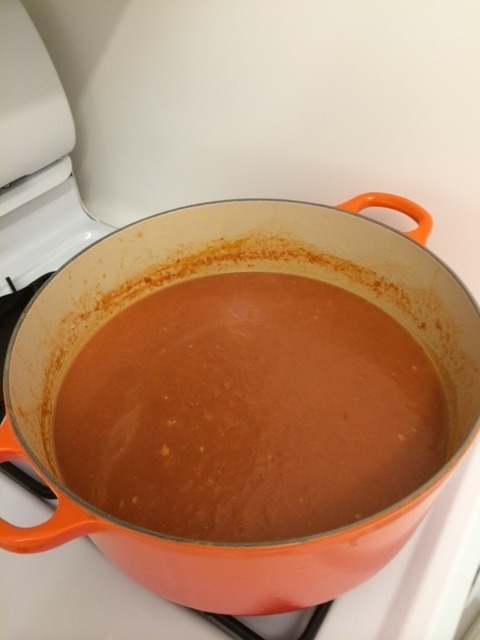 Next I partially cooked the orzo and then added it to the soup – along with some heavy cream – and let it simmer for another 15 minutes or so while I made the grilled cheese sandwiches. 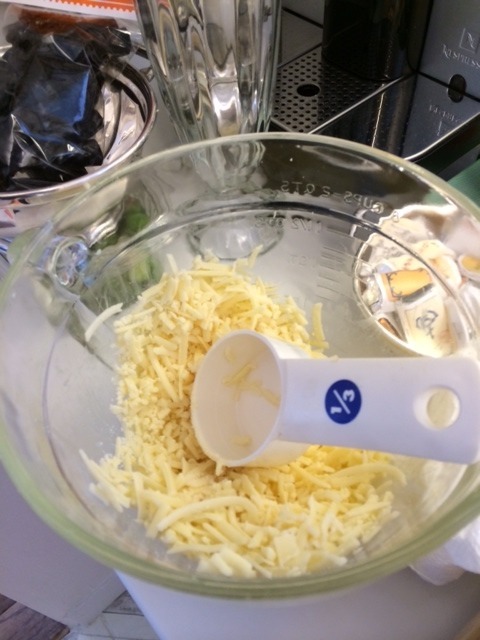 First I put some Cabot Sharp Cheddar Cheese and some good quality Gruyere into the Cuisinart and grated them together. 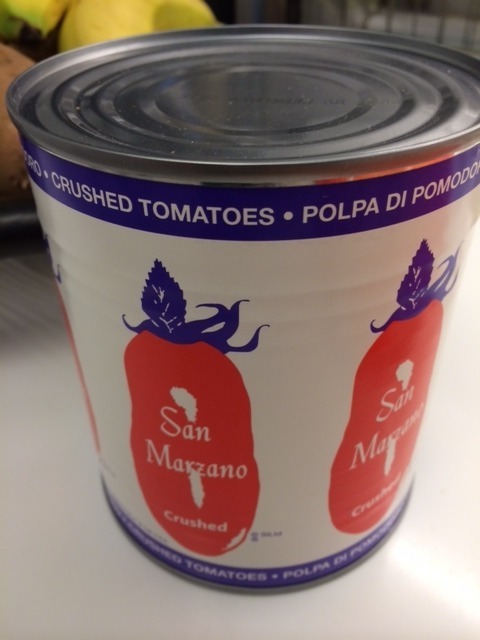 Next I mixed up mustard, mayonnaise, and parmesan cheese. 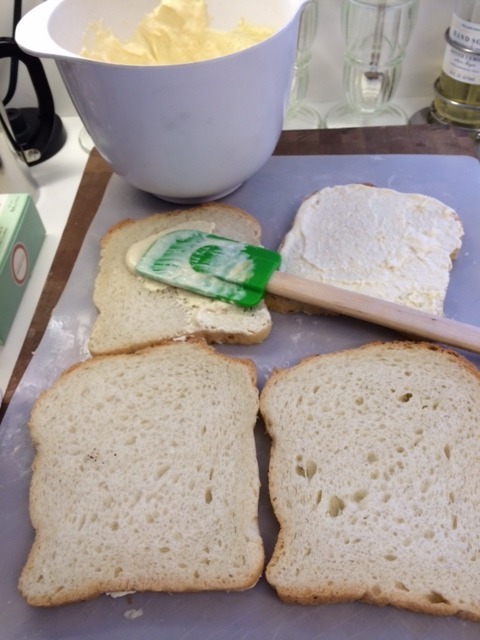 I then spread softened butter on one side of twelve slices of Country White Bread from Eli’s and the parmesan mixture on the other side of each slice. 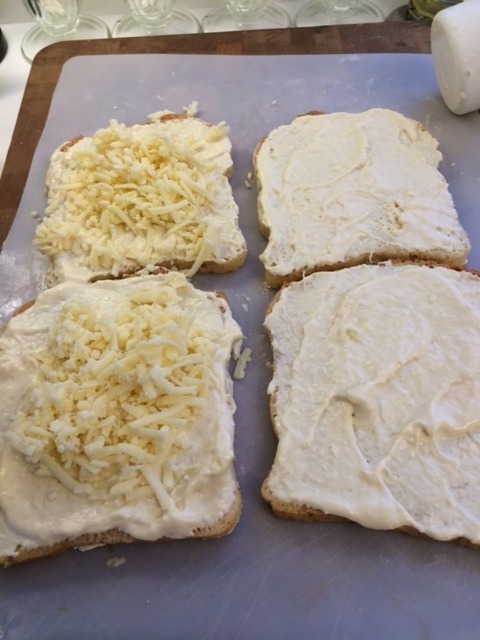 Finally, I piled the grated cheese on six of the slices, sandwiched them up and started grilling them on the panini maker for about 3 – 4 minutes each. 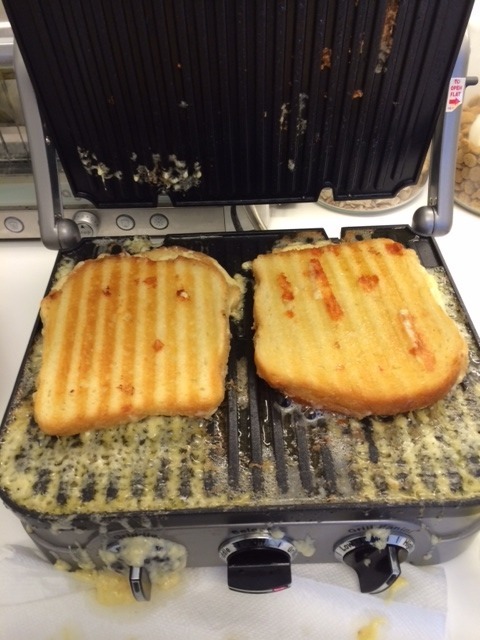 I had to play around with the settings on the panini maker because clearly at first the setting was too hot and the cheese was melting all over the counter – yikes! At long last we were ready to eat. 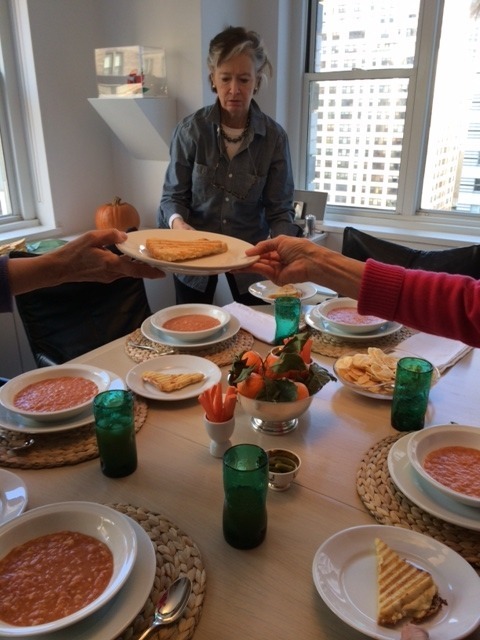 We ladled out the soup into our bowls, helped ourselves to the sandwiches (on a fabulous wooden board purchased last summer from Bloom in Sag Harbor) and…YUM! 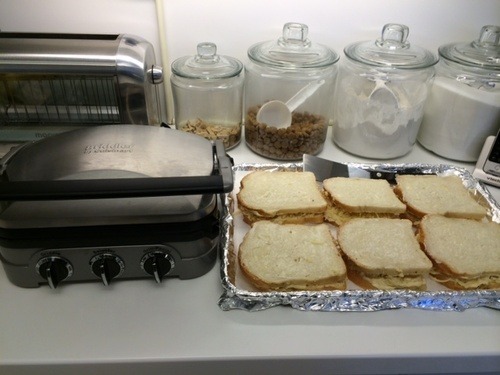 S serves everyone grilled cheese sandwiches. 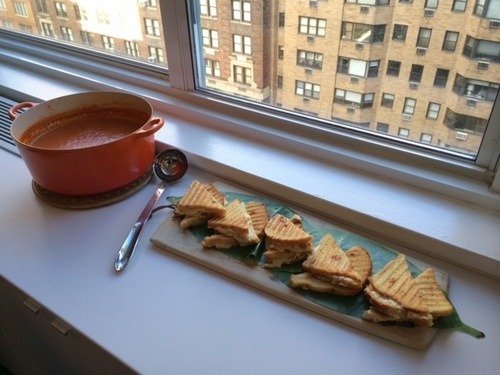 When all was said and done, this was a perfect lunch for a really cold and blustery day.